Carnival Corp. staged a live teleconference from the decks of the Regal Princess, demonstrating the new Medallion technology’s bandwidth and connectivity. The ship is the first to implement Medallion, part of which is a faster and more reliable internet connection. During the demonstration in the Bahamas, Carnival attempted to harness 1.5 gigabytes per second of bandwidth to show that connectivity is a rapidly fading concern on ships. Carnival showed that games and video streaming ran adequately on the Medallion internet. John Padgett, Carnival’s chief experience and innovation officer, presided over the demonstration and said that the largest bandwidth reported to date by a cruise ship had been 580 megabytes per second. Unlike homes, cell phones or most hospitality venues, cruise ships at sea are out of touch with the usual transmission networks for Internet signals and must rely on satellites. Until recently that service has suffered from slowness, unreliability and expense. “There’s always been a liability associated with cruising and that has been connectivity,” Padgett said. He said he hoped the stress test would prove that cruise ships now have the same technical capacity as land resorts for connectivity. “Once we dispel the myth that connectivity is a problem, we’ll open up the cruise market to new demand,” Padgett said. To gain better connectivity, Carnival has partnered with SES Networks, which has an array of high and mid-earth orbit satellites, which can shorten the time that signals travel back and forth in the atmosphere, improving connectivity. Steve Collar, CEO of SES Networks, said on the conference call that the quality of Internet service is affected by the distance to the satellite and by the amount of bandwidth devoted to the transmission. He compared earlier service on cruise ships to a four-lane highway, and said the bandwidth in the demonstration is more like a 50 or 100 lane highway. The precise amount of bandwidth in use during the call will be subject to later verification. “Now it’s about making that bandwidth affordable, and seamless and efficient,” Collar said. Padgett said the super-fast Internet for now is available only on the Regal Princess and he declined to give a timetable for its implementation on other Princess or Carnival Corp. ships. But he said there’s been much progress in making the Internet service faster and more reliable. “All of our ships have connectivity, and we’ve made a dramatic improvement across the fleet over the past few years,” Padgett said. Carnival Cruise Line will add Havana as a regular destination for a second ship in 2019, as the Carnival Sensation will sail Cuba-bound voyages from Miami. The Carnival Paradise, sailing from Tampa, currently operates cruises that visit Havana. In 2019, the Sensation will sail a series of 17 five-day cruises. The first voyage to feature Havana will depart April 22, 2019, and include Havana, Nassau and Princess Cays. 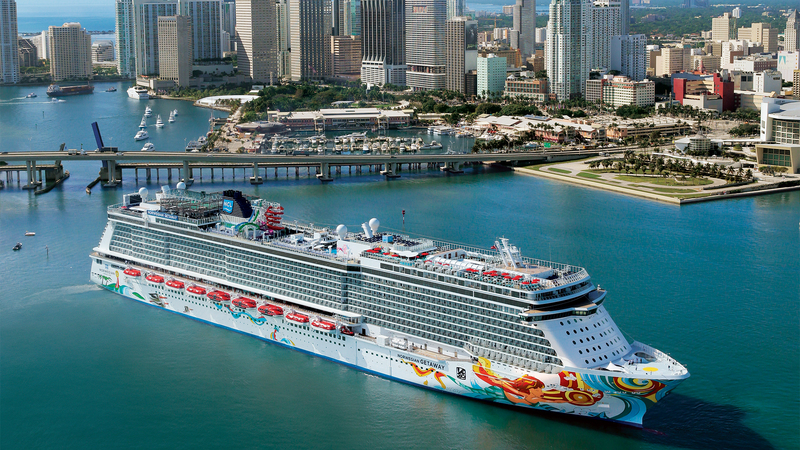 Norwegian Cruise Line Holdings’ net income rose 23% last year to $780 million, as European pricing and bookings recovered faster than expected and the booking curve extended to a near-optimal length. Revenue rose 10.7%, to $5.4 billion. The Wave season for 2018 has started strong and the outlook for 2018 is bullish, driven by a strong economy and consumer demand, CEO Frank Del Rio said. “This year is by far the most excited, the most energized and the most optimistic I have ever been at the start of a new year,” Frank Del Rio said. He said the strong demand environment of late 2016 and 2017 has “accelerated through this year’s early Wave season, as both the number of bookings sold and the price points achieved reach record levels” across all three brands — Norwegian Cruise Line, Regent Seven Seas Cruises and Oceania Cruises. “Our overall booked position during the first seven weeks of 2018 further improved compared to the same time last year,” he said. He said on average NCLH guests are booking five weeks earlier than at the end of 2016. Del Rio said the weak link if there is one, is China. “I don’t think China is hitting on all cylinders as it can,” he said, referencing the continued tensions with South Korea and the resulting uniformity of short cruise itineraries, which can only visit Japan. Nevertheless, he said China was profitable in 2017.